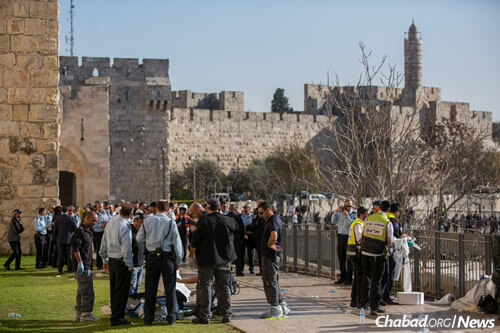 JERUSALEM—Two Jewish men who were killed in a terrorist stabbing attack yesterday just outside the Jaffa Gate entrance to the Old City have been laid to rest in Jerusalem. A third stabbing victim remains hospitalized. Rabbi Reuven Birmacher, a 45-year-old teacher at the Aish Hatorah yeshivah in the Old City was laid to rest late Wednesday night. Funeral services for OferBen Ari were held on Thursday. Born in Argentina, Birmacher immigrated to Israel after becoming more religiously observant, studying at the Belz chassidic group’s Torah V'Emunayeshivah. In recent years he devoted his life to Torah study and teaching. Birmacher, a resident of Kiryat Ye’arim, is survived by his wife and seven children. "He was a beloved rabbi and admired greatly by the Spanish branch of our yeshivah," said Rabbi Steven Burg, Director General of Aish HaTorah. "The rabbi used the morning to teach Torah and was murdered on his way out of the Old City. The entire yeshivah will attend the funeral. May G‑d strengthen us in this difficult time and we pray the rabbi will be an atonement on behalf of all of Israel." Ben Ari passed away after being rushed to Shaare Zedek Medical Center with a gunshot wound sustained as the two terrorists were shot and killed by police. He is survived by his wife and two daughters. “He was a hero, we have good memories. He was a man of gold who never harmed anyone,” Ben Ari’s 16-year-old daughter told the Walla news site. 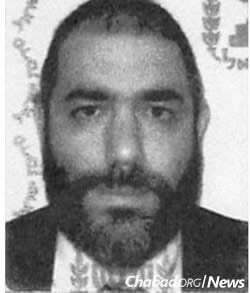 Rabbi Reuven Birmacher, a 45-year-old teacher at the Aish Hatorah yeshivah was killed in the attack. The terrorists were identified by authorities as former security prisoners Issa Asaf, 21, and Anan Hamad, 20, both from the Qalandia refugee camp. Hamad was arrested in 2010 for threatening Israeli soldiers at a checkpoint, and Asaf was jailed earlier this year for participating in violent demonstrations. A third stabbing victim remains hospitalized in serious but stable condition at Shaare Zedek. More than 20 terror victims have been killed and scores injured in a wave of attacks since October 2015. Jerusalem has been a focal point of the violence, with a number of attacks taking place inside or near the Old City.